Siding with the Golden State Warriors, a federal judge has dismissed a lawsuit alleging that the team's mobile app violated the wiretap law by eavesdropping on users. U.S. District Court Judge Jeffrey White also dismissed wiretap allegations against app developer YinzCam and beacon technology company Signal360. White's decision, issued late Monday, stems from a class-action complaint filed last September by New York resident LaTisha Satchell. She alleged that the Warriors' mobile app turns on devices' microphones, and then records conversations and other audio whenever it's running, even if people aren't actively using the app. Satchell, who said she used the app from April through July of 2016, accused the Warriors, YinzCam and Signal360 of violating the wiretap law by intercepting and using her private conversations without consent. 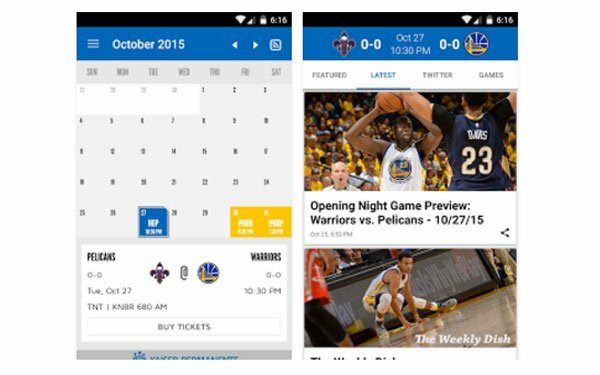 The app sends offers to fans when they pass concession stands, and notifies users about the possibility of seat upgrades at the team's home stadium in Oakland, California. To accomplish this, the app tracks users' physical locations via beacons, which transmit out audio signals that are picked up by phones' microphones, according to Satchell's complaint. Last month, the Warriors, Signal360, and YinzCam asked U.S. District Court Judge Jeffrey White in Oakland to dismiss the complaint, arguing that the app doesn't violate the federal wiretap law. White said in his ruling that Satchell's complaint didn't support a wiretapping claim against the Warriors, YinzCam or Signal360 for several reasons, including that she didn't allege sufficient facts to show her conversations were "intercepted" or "used" by the companies. Although Satchell alleged that she carried the phone with her while having private conversations, she didn't offer specifics in her complaint, according to White. Also, she didn't detail how the Warriors, YinzCam or Signal360 used any conversations they allegedly captured, White wrote. "There are no allegations that plaintiff was speaking to someone, privately, about a particular topic while the app was running and she suddenly received an advertisement about that topic," White wrote in the 15-page ruling. White's decision is "without prejudice," meaning that Satchell can revise her complaint and try again. But the opinion presents some hurdles for Satchell's lawyers, according to Santa Clara University law professor Eric Goldman. He says the ruling appears to require Satchell to offer at least some details about specific conversations she had when the app was running. But that requirement for specificity could make it harder for her to proceed with a class-action, where contested issues are supposed to be decided on a classwide basis. "This opinion boxes in this lawsuit," Goldman says. "It leaves the plaintiffs little room to navigate."